“One-on-one mentoring offers a personalised approach that many other forms of education don’t.” – The six types of education that can help your career, by Lisa Almond (Women’s Agenda) featuring Sue White on one-on-one mentoring. After my first mentoring session with Sue – I was able to polish a commissioned story, refine a pitch (a yes within one day of submission) and brainstorm more than fifteen angles for an upcoming overseas trip. – Jocelyn Pride, recent mentoring student. I believe success in the writing industry comes from hard work, persistence, and learning from those who’ve been there before you. Knowing how to break through and get noticed by editors, questioning if your ideas are good enough, or wondering if your feature has the right ‘flow’ are concerns all freelance writers face. Often the best way to resolve these issues is to talk them through with someone working in the industry. For a limited time and especially for graduates of Australian Writers’ Centre courses, I will be offering mentoring sessions to help with any issues relating to your writing. Recent mentoring participants have used their sessions to plan writing strategy for the year, refine their pitches, get advice on how to tackle a story edit, ask an experienced freelancer how to work feedback from an editor into a revised draft, or simply brainstorm story ideas. This is a question and answer only session. NO documents uploaded. 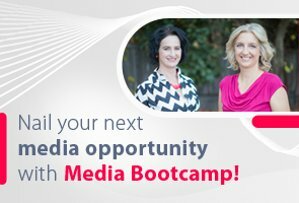 You can ask questions about pitching, interviewing, time management, dealing with editors, chasing money – you name it! Upload up to 3 documents for me to look over and discuss during the session. These could be stories you are working on or pitches you are putting together, or a mix of both. Please note: a baseline knowledge of feature writing is expected before starting mentoring with me. 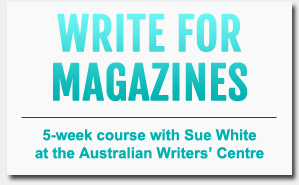 The Australian Writers’ Centre offers a variety of different Magazine and newspaper writing courses that are economical and well designed. We highly recommend you do one or more! 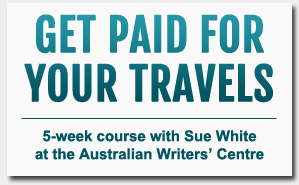 Both courses I teach (magazine writing and travel writing) currently have a very active private Facebook group that is open only to Australian Writers’ Centre graduates – this is an excellent way to receive lots of post-support advice and support (for free!) from other new writers.